"We won't be beaten on price"
All of our prices include a discount from the manufacturers retail price. 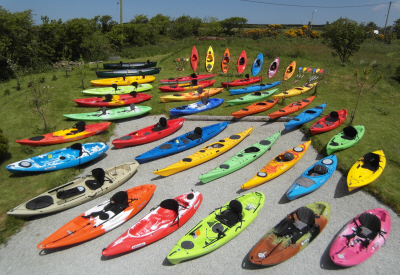 At our showroom and workshops we have 125 kayaks for sale from Dagger, Pyranha, Venture, P&H, Mad River, Old Town, Islander Sit on Tops, Tootega, Ocean Kayak and Wilderness Systems. We also stock paddles, spraydecks, buoyancy aids and kayaking and canoeing equipment from Palm, Phoenix, Nookie, Gul, Streamlyte, Werner and Robson. Most customers call and view the products in our showrooms but we also mail order boats and gear across the UK. we rotomould kayaks too, come and see how. As experienced paddlers and also kayak designers and manufacturers ourselves we have a pretty good understanding of what type of boat will best suit a paddler. Before advising a model of kayak or canoe we will ask you questions about your experience (or lack of! ), ambitions, family and friends who might use it and anything else of relevance. We will then recomend 2 or 3 models for you and explain the pros and cons of each model so you are able to make your own informed decision in order to best enjoy your canoeing or kayaking. If you are just starting out take a look at some of our information pages such as the kayaks page or even give us a call. We have been in business for over 25 years and have many thousands of satisfied customers; our success is due to our excellent service and the quality of the products we supply. Our unique rural location provides a beautiful setting with views of open countryside and Cornish engine houses and is positively remarked upon by many customers. We are an environmentally friendly business with extremely low carbon emissions and all canoe packaging is recycled. Customer Quote: "I knew you'd be down a lane, all the best places are down lanes"
Wild Things also specialise in the manufacture of general purpose kayaks for paddlers who are looking for easy to use, high quality boats with unbeatable value and superior performance. Our popular and proven Wild One all-round kayak will provide many years of reliable kayaking and is designed for beginner to advanced general-purpose paddling. You will find it lighter, faster, more responsive and much more individual than other brands, a true all-rounder for medium distance sea kayaking as well as whitewater kayaking and surfing. you can read some paddlers reports on the reviews page. Our customers find us very easy and genuine to deal with and we often spend half an hour or more on the phone helping people make the right choice - even if it's something secondhand they've found in the paper!! This is extremely important for sit on top kayaks as well with so many designs available. Please have a look at the page below to see our extensive stock. Easy to find just 6 minutes off the A30 trunk road. 20 minutes from Truro, Falmouth, Perranporth, Hayle, St Ives & Helston.